Sambucus nigra is the Latin name for elder and has clear etymological roots. Nigra means “black” and refers to the color of the juice from the elderberry. 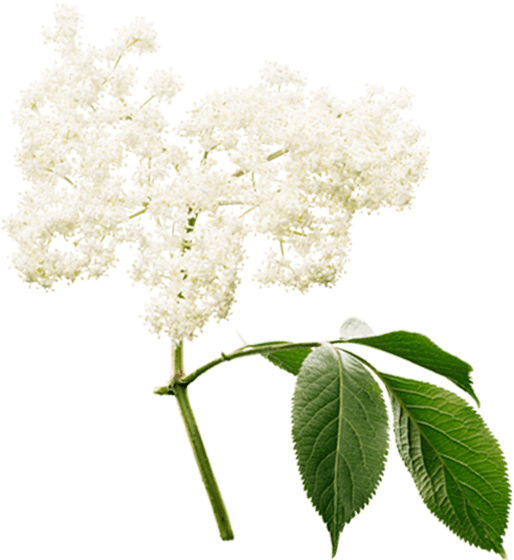 Although sambucus does not have a single set definition, it can be interpreted as a reference to the sambuca, an ancient stringed instrument that may have been carved from elder wood. Carefully wash 150 g of elderflowers. Bring 1 L of water containing 1 kg of sugar to the boil, then leave to cool down. Then add the elderflowers and 25 g of citric acid to the sugar water. Leave in a dark, cool place for three days. Prepare the bottles in which to store the syrup. Pour the elderflower syrup through a sieve and then pour into the bottles. To conserve the syrup, add a few drops of alcohol (80% ABV) and then set alight.